Still reeling from the events of “Purple Wedding,” the Lannisters look to regroup. And Daenerys finally reaches the city of Meereen. Jumping right into the action this week, we picked up directly where we left off last, with Joffrey turning a horrible shade of purple in the arms of his mother Cersei, who was screaming that Tyrion was the murderer. Here the focus shifted to Sansa as she got spirited away by the drunken fool Dontos. A short little boat trip later and we find out who the mastermind behind her escape is: Littlefinger! It’s been a while since the duplicitous Lord Baelish has shown up on the show, but considering his past with her mother, him being behind Sansa’s escape isn’t a massive shock. Though in his short time on screen here, he manages to remind us how dangerous he can be, as poor Dontos gets a crossbow bolt instead of the money he was promised. It’s taken a while, but both the remaining female Stark children have found their way out of Kings Landing, but both remain in the company of very dangerous men. We find out very quickly that Sansa’s escape from Kings Landing was impeccably timed as she quickly becomes a “person of interest” in Joffrey’s death. Tywin tentatively sets about doing a bit of investigating into the matter, approaching Oberyn who also would be a prime suspect in any murder. Oberyn’s knowledge of poisons in particular was brought up here, and in fact he was the one to confirm to Tywin that it was indeed murder instead of accidental choking, even though that may have seemed pretty clear to the viewer. His hatred of the Lannisters might seem like a fairly large sticking point, but Tywin offered him a seat on the Kings Small Council, which Oberyn accepted. In his few short appearances so far, Oberyn has become a very intriguing character, so getting him more heavily involved with the inner workings of Kings Landing can only be good going forward. With Joffrey out of the way, a new King has to step up and that honor/death sentence falls to Joffrey’s brother Tommen, who hasn’t had a large part to play on the series yet. He’ll get to eventually marry Margaery and generally seems like a non-psychopath, so things may just be looking up for the realm. Unfortunately, not all is well in the Lannister family as we got another hugely shocking moment to add to the shows ever growing list of “OMG” moments. 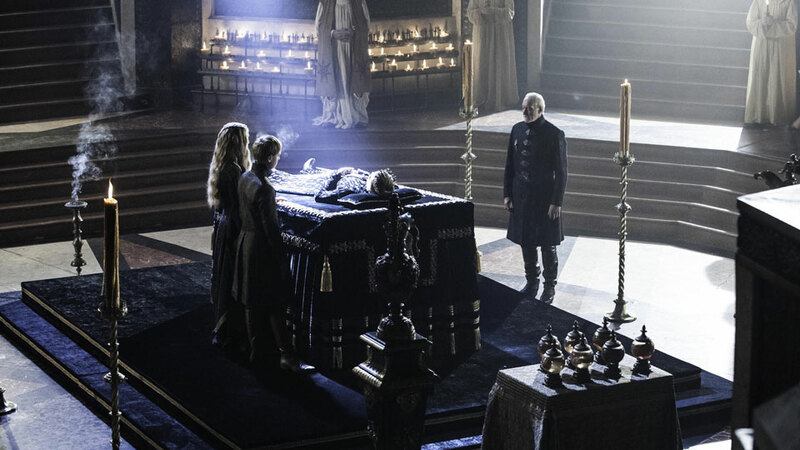 Jaime and Cersei’s incestuous relationship has always been controversial, but this was ratcheted up a notch this week as a spurned Jaime forced himself upon Cersei, right beside the corpse of their illegitimate child. Jaime has become a real fan favorite on the show after appearing to be a straight up villain at the start, but this is certainly a huge step backwards in that regard. This is a whole different kind of shock than the “Red Wedding” for example, but considering it’s a rather large departure from the source material, I can’t help feeling it may have been added for a little bit of shock value. Tyrion got a little bit of screen time this week as he sat in his cell awaiting his trial, which we learn will take place in two weeks (show time, not our time). His loyal squire Podrick visits him, but Tyrion promptly sends him away, out of Kings Landing before he manages to get himself killed. It’s a great moment to see from Tyrion as he puts someone else’s needs ahead of his once again. We learn Bronn is also being kept away from seeing him, so Tyrion now finds himself very much alone, much like Ned Stark did in Season 1. Also getting a single scene in Kings Landing this week was Margaery as she chatted with Olenna about how she must be cursed. After what has happened to her last two husbands, I find it hard not to agree with her! 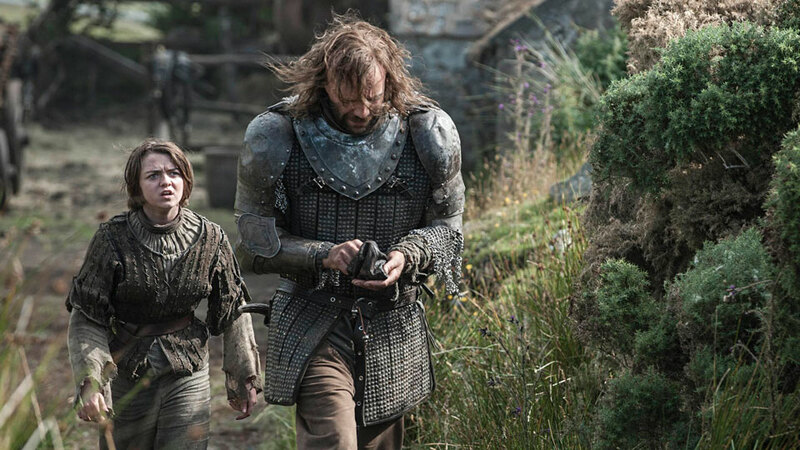 The Hound and Arya continue to be wonderful to watch as they journey towards The Eyrie, with their back and forth conversations being one of the highlights of each episode. Here they came upon a farmer and his child who offered them room and board in return for The Hound’s protection from bandits. It’s always impressive to see how far Arya has come since the start of the series, as her quick thinking and sharp tongue ends up gaining them this opportunity. Of course it would all prove to be for nothing in the end as The Hound was only playing along to relieve the man of his money, although I guess the fact that he didn’t kill anyone is a plus! We got a bit more action involving The Nights Watch’s struggle this week as Ygritte’s band of Wildlings continue to cut a bloody swathe across the lands towards Castle Black, and Jon Snow realized the mutineers at Craster’s Keep could potentially reveal important information to Mance Rayder. The main bulk of the action revolved around Sam and Gilly this week though, as he ended up deciding to move her from Castle Black to a nearby village. His reasoning behind this was that he couldn’t protect her against his fellow Nights Watch brothers, but this seemed incredibly flimsy to me considering he can’t protect her at all now that she’s gone. I’m actually just wondering if this was a convenient way for the writers to remove her from the story for a while because they couldn’t decide what to do with her. 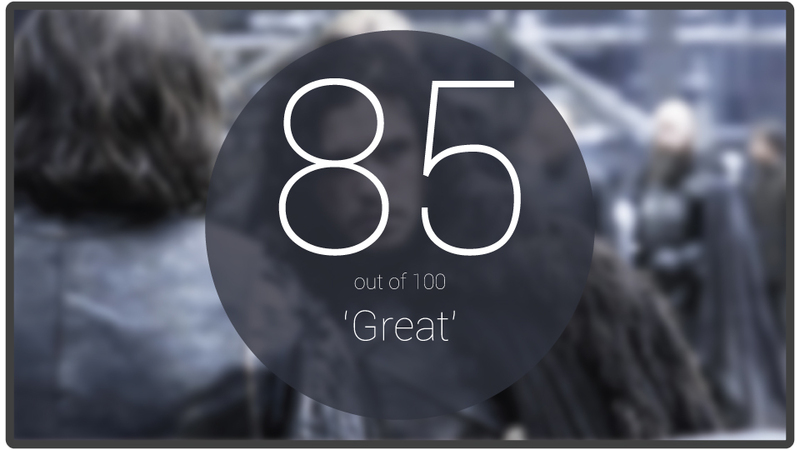 Daenerys finally arrived at Meereen this week and the size of the task ahead was revealed. The city is a veritable fortress and even though her army has grown, it still doesn’t look big enough to topple the city on its own. However, she does seem to be learning that her words can be a hugely powerful weapon as she delivers a speech directed at the city’s slaves. Who needs an army outside the city when you can recruit one to do your work from the inside? Her words seem to have had an effect, but we’ll have to wait to see if it’ll be enough. We did get a rather wonderful scene involving Daario facing off against Meereen’s champion fighter. The way he nonchalantly dispatched his challenger was impressive and helped highlight the skillful fighter Daario can be. 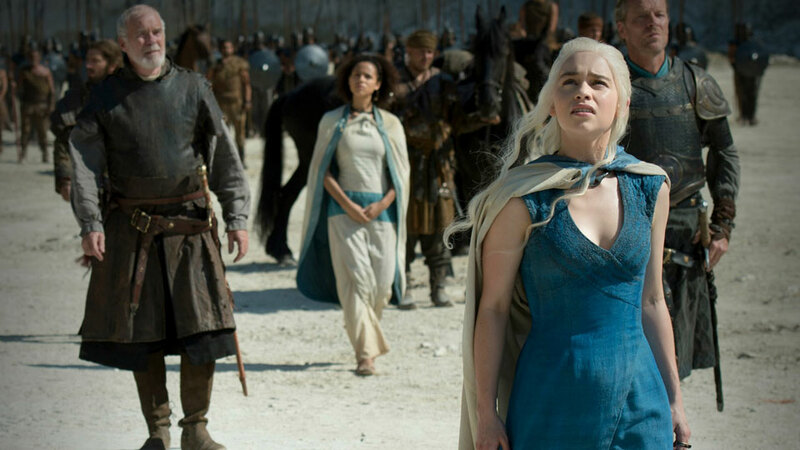 After the rather crowd pleasing end to last week’s episode, “Breaker of Chains” slowed things down a bit but still managed to move plenty of storylines along. Daenerys siege of Meereen is upon us now so that’ll surely be a highlight of the coming weeks, along with the Nights watch heading out to deal with the mutineers. Tyrion’s trial is still a little bit away, but I’m sure there’s plenty more to come from that. In his few short scenes this week, Davos seemed to have some sort of idea that may make Stannis relevant in the struggle for power again. Three episodes in and things are already shaping up rather nicely.